Grayton Beer Co., located in Santa Rosa Beach, Fla., released its newest seasonal beer, Handful of Thorns. The limited-release session India pale ale made with fresh red roses began pouring into the Grayton Beer Co. taproom, retailers, bars and restaurants this month. With an ABV of 6.7 percent, the new Handful of Thorns is a drinkable yet complex American Session IPA that lends itself to having more than one and is perfect for the hot summer weather, according to the brewery. The simple and subtle dry malt bill with low sweetness builds an ideal stage on which to spotlight a unique floral hop profile and all of the complexities that fresh rose petals offer. The end result is an incredibly refreshing ale with earthy and herbal notes and a bright floral aroma. 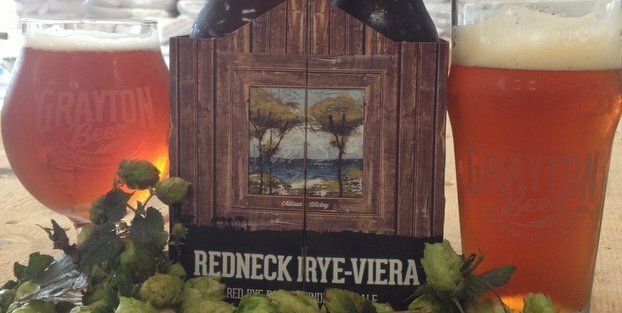 This beer is versatile when pairing with food, and its hop profile will serve well in cleaning up spiciness, making it a perfect complement for Cajun fare such as gumbo or jambalaya. The brew’s strength allows it to enhance many dishes without overpowering and makes it a great companion for a low country boil or simple hot wings and pub fare. The IPA is also a part of Grayton’s Artist Series, a challenge the brewery put out to local artists to design select labeled beers where a portion of the proceeds would go toward art-based initiatives and charities in the Panhandle. The artwork used on the Handful of Thorns label was created by Bryan Hand, a Northwest Florida artist specializing in colorful, realistic acrylic paintings. Grayton Beer Company currently offers four year-round styles of beer in its portfolio of brews that range from an Amber Ale, which carries the name 1890 Founder’s Ale, a Belgian White, or Witbier, named White Dunes and a dry-hopped Pale Ale. The company also produces the 30A Beach Blonde Ale, which incorporates 30A.com’s iconic blue logo. For more info, head over to the brewery’s website.